“I saw that we should strive at all times to be free from unhealthy excitement. I saw that there was great danger of leaving the Word of God and resting down and trusting in excitement.” (Manuscript Releases, vol. 5, pp. 226, 227). Charismatic movement in Roman-Catholic Church, including healing sessions, corresponds with charismatic movement in Pentecostal and other evangelical denominations, with the same manifestations. It means that the source or the spirit of those spiritual manifestations such as healing, dreams, spiritual praying, ecstatic singing, prophesying and speaking in tongues is the same. 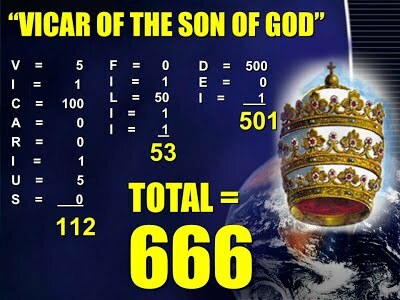 However, such spiritual manifestations in Catholic Church can’t be inspired by God’s Spirit because this church (papal Rome) is presented in the Bible as a beast that opposes God’s Truth (>) and persecuted millions of true Christians in the past, and according to the book of Revelation, will persecute them again in the future (>). The goal of papacy is to regain the world’s religious and political supremacy. In order to achieve this goal Rome introduced the ecumenical movement of which foundation and common ground is Sunday keeping and charismatic movement. These two elements of the ecumenical movement, which are common for both catholic and charismatic evangelical churches, managed to unite Catholicism with fallen Protestantism, in spite of the fact that papacy never denounced its false doctrines that oppose God’s Truth found in the Bible (>). In 1965 Reverend Erwin Prange wrote, “recently I attended a Roman Catholic, Episcopalian and Lutheran retreat…I am convinced that the basic meaning of the charismatic renewal is the reunion of the churches” (>). Also Charles Colson confirms the same in his book Evangelicals and Catholics Together: “The spread of the charismatic movement through songs, prayers and worship styles going well beyond officially charismatic circles, has done a great deal to reduce the barriers between Catholics and evangelicals” (>). In Christian charismatic churches there are many who heal thousands in the name of Jesus. 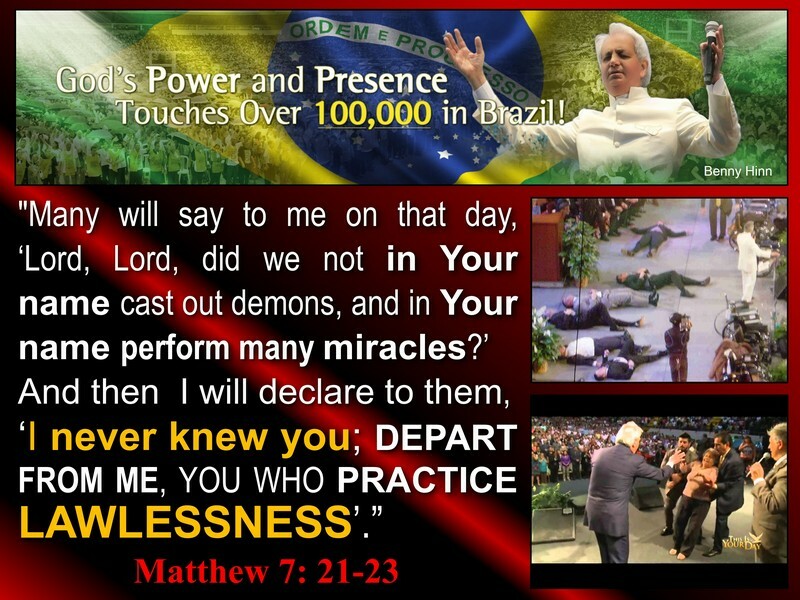 One of the most famous among them is Benny Hinn. He claims God anoints him with the Holy Spirit to lay hands on people and heal them. The very popular YouTube video titled “Benny Hinn: Let the Bodies Hit the Floor” illusrates it very well. Likewise there are many charismatic healers in the Catholic Church. Richard McAlear is an excellent example with his lips moving in silent groanings. 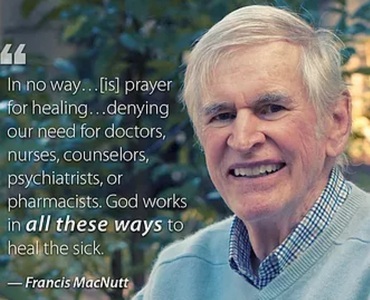 Also Francis MacNutt has introduced thousands of Christians to miraculous healing. Now 79, he hopes to train an army of healers to take his place. Often he will stand in front of an audience and sing in an unknown language. He doesn’t know what he’s saying, and neither do the people in the crowd. “I feel stupid doing it,” he says of the unusual practice. “I’ve been doing it for 25 years and it still feels funny.” After he lays hands on people, they fall to the floor. 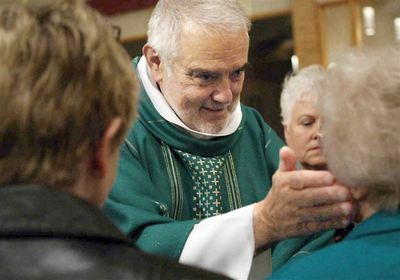 A priest he prayed for in England lay on the floor for two hours and got up healed of depression. MacNutt was baptized in the Holy Spirit in 1967 through the influence of charismatic healing pioneer Agnes Sanford. She prophesied that the enthusiastic Dominican priest would take supernatural healing to the Catholic Church worldwide. He took his newfound Pentecostalism to 30 countries. With reference to the fanatical excitement, which included tongues-speaking, that attended one group of people who set the time of Jesus’ coming at 1854, Ellen White wrote: “Some of these persons have exercises which they call gifts and say that the Lord has placed them in the church. They have an unmeaning gibberish which they call the unknown tongue, which is unknown not only to man but by the Lord and all heaven. Such gifts are manufactured by men and women, aided by the great deceiver. Fanaticism, false excitement, false talking in tongues, and noisy exercises have been considered gifts which God has placed in the church… When the happy flight of feeling is gone, they sink lower than before the meeting because their happiness did not come from the right source” (Testimony for the Church, vol. 1, p. 412). MacNutt’s glorious days of favour and applause ended abruptly in 1980 when he did something his Catholic brethren could not accept: He married, but after the excommunication the MacNutts began to receive speaking invitations from Episcopalians, Presbyterians and Pentecostal groups. Mike Evans was a Baptist when he heard MacNutt speak in Bakersfield, California, in 1987. He was as sceptical of Catholics as he was of charismatics, but when he heard MacNutt speak on healing he embraced the charismatic experience and eventually became one of MacNutt’s closest colleagues. Since, according to this statement it is not Christ who gave them the power to heal than who enabled them to do it? They obviously do it not through the power of Holy Spirit but the influence of evil angels who want people believe that those who heal them represent true Christ’s church. The following statement by Ellen White corresponds with what Lord Jesus said about those healers as she declares that, “Men under the influence of evil spirits will work miracles. 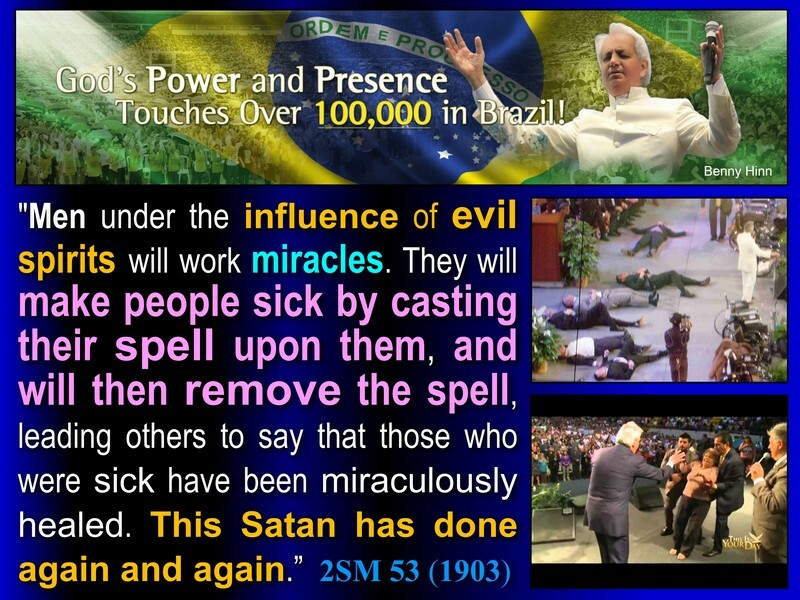 They will make people sick by casting their spell upon them, and will then remove the spell, leading others to say that those who were sick have been miraculously healed. This Satan has done again and again” (2SM, 53, 1903). Apart from meaningless speaking in tongues, noisy music or prophesying, there are various bizarre behaviours associated with charismatic movements. One of them is referred to as being slain in the spirit. It occurs when preachers place their hands on someone’s forehead, or when they gesture forcefully towards targeted individual or even entire audience, causing them to be violently thrown back to the ground as if pushed by an invisible force. Often, these charismatic healers have men who attend the falls in an effort to avoid injury during ecstatic episodes. Another symptom associated with charismatic services is described as drunk in the spirit. It may involve spastic crawling on the floor, hypnotic dancing, shaking, uncontrollable laughing, inability to speak, etc. These abnormal and senseless manifestations resemble demon possession and have nothing to do with true healing described in the Bible and they can’t be empowered by God’s Spirit of love, peace, harmony, wisdom and order. Some time ago I was told about certain sister who was a member of the SDA church in Poland. 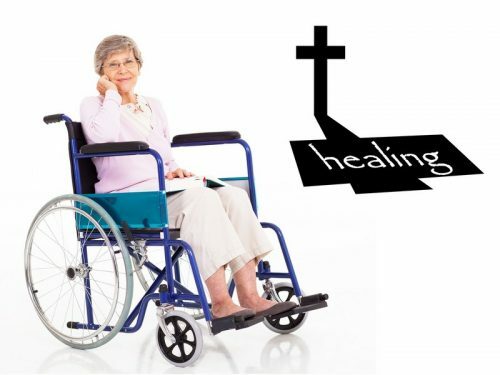 She was paralysed for a long time and earnestly prayed and often enquired from the church members to ask God to heal her. Unfortunately, for some reason she wasn’t healed. Finally someone from her own church suggested her to visit one of the charismatic churches where different people were often healed. And although in her spirit she doubted that those miracles were performed by God’s Spirit the temptation was too strong to resist and finally she went there with her friend. And lo and behold, she was finally healed and was able to move without a wheelchair. However, although she was excited about being able to walk again, yet at the same time something strange happened. After that charismatic healing she completely lost her inward peace. Now her heart was filled with anxiety, remorse and fear as if she had committed a horrible sin. It was such a burden that she asked her church members to pray for her. And when they did asked the Lord to give her piece, guess what happened? She had her peace back but the effects of that charismatic healing were gone and she became paralysed again! It is interesting that people who are healed by those false Christian healers always loose conscience and fall, but in the Bible those who were healed by Jesus or apostles were always conscious and did not fall. 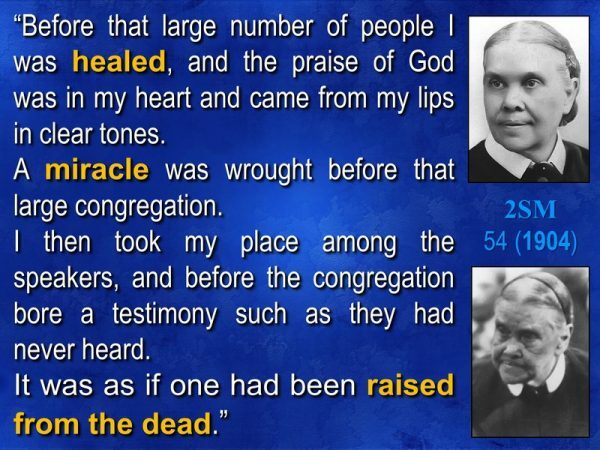 Let me give you an example of true and performed by the Lord healing which was experienced by Ellen White. 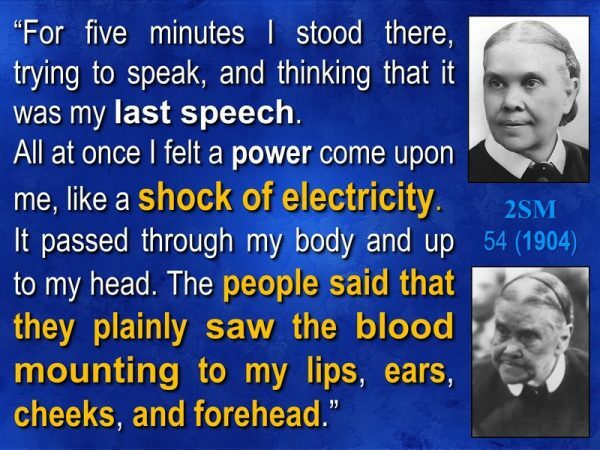 This is the kind of powerful healing which can’t be imitated by Satan: “For five minutes I stood there, trying to speak, and thinking that it was my last speech. All at once I felt a power come upon me, like a shock of electricity. It passed through my body and up to my head. The people said that they plainly saw the blood mounting to my lips, ears, cheeks, and forehead. Before that large number of people I was healed, and the praise of God was in my heart and came from my lips in clear tones. A miracle was wrought before that large congregation. I then took my place among the speakers, and before the congregation bore a testimony such as they had never heard. It was as if one had been raised from the dead” (2SM, 54, 1904). 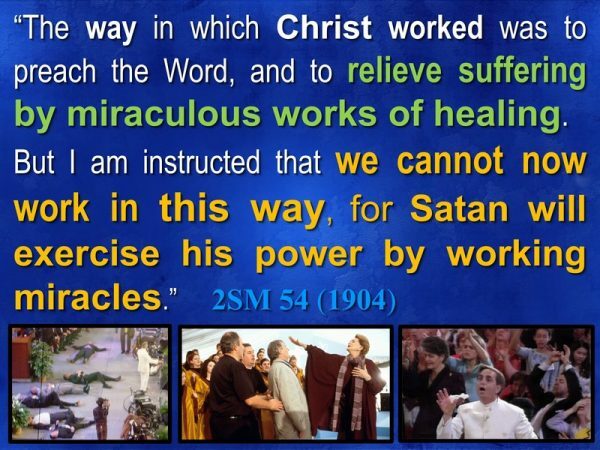 This statement is very important so please try to remember it: “The way in which Christ worked was to preach the Word, and to relieve suffering by miraculous works of healing. But I am instructed that we cannot now work in this way, for Satan will exercise his power by working miracles” (2SM, 54, 1904). Also keep in mind that conventional medicine, especially prescribed drugs and any medication which is harmful is not a part of the right arm of the gospel or our health message as it causes horrible side effects often leading to death. 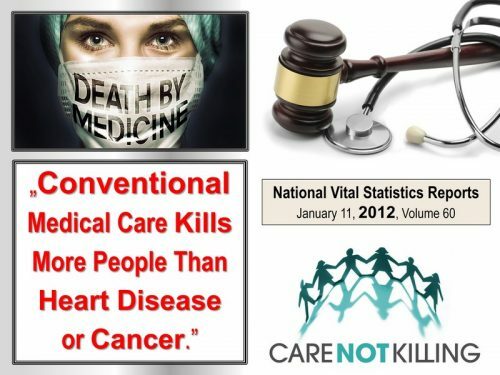 According to the National Vital Statistics Reports, “Conventional Medical Care Kills More People than Heart Disease or Cancer” (January 11, 2012, Volume 60). Can you believe this? Conventional medical care, instead of being more effective in saving lives kills more people than heart disease or cancer! I think as Christians we should be brave enough to ask governments, NHS, the medical and public health authorities, why in spite of the fact that we know how harmful and dangerous the conventional medicine and often medical care is, why medical students still don’t study about nutrition, why they are not taught about the importance of healthy lifestyle, natural remedies, herbs, hydrotherapy, and good quality supplements? And what is the answer to the question? The answer is, of course, the money of selfish big pharma which seem to control modern conventional medical world! When I was doing my master’s degree in public health at the University of Liverpool, I often tried to express my concern about present condition and mistakes of NHS and the health care as well as great demand for health reforms, do you think it was welcomed? No, every time I tried it was condemned, regarded as a bad idea or a heresy. Today it is not even a secret that the public health authorities, governments, health care, and entire medical world are controlled by rich pharmaceutical companies. 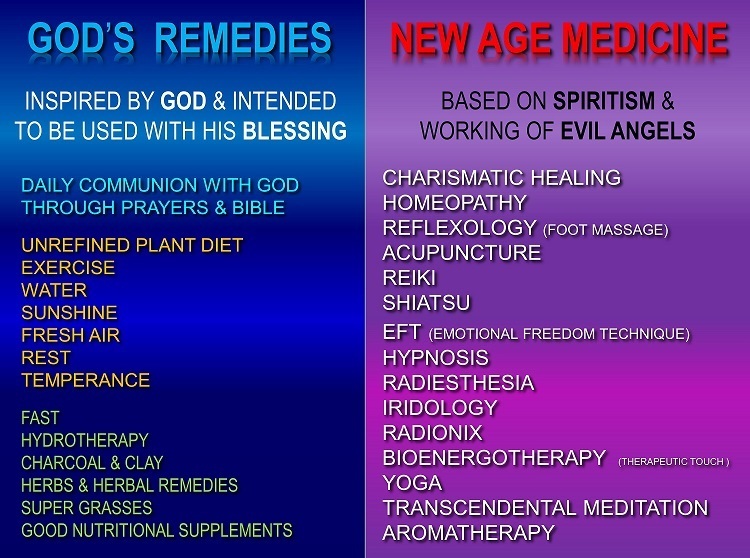 But, let me give you an example from my own experience how effective are God’s remedies, especially when they are combined with prayers. In 1989 three years after my baptism, the Lord sent me from Poland to America where together with students from different countries I participated in a special one-year health and medical missionary training. I was living there with my friend sharing room with him. Unfortunately, after about six months somehow he contracted a virus and was diagnosed with chickenpox, suffered from very severe symptoms, high temperature and couldn’t participate in training for about two weeks. 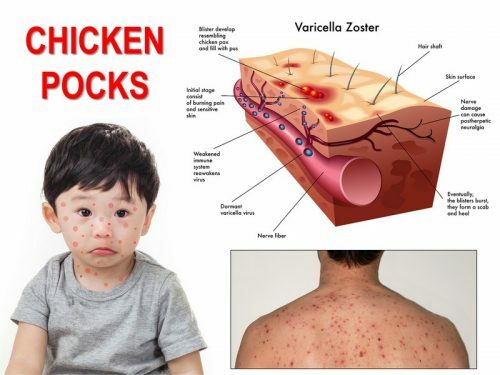 But since as a child I didn’t go through chickenpox and wasn’t vaccinated, thank God, now everybody was looking at me with pity as they knew I would be the next victim of the chicken pox virus as it is extremely contagious and I shared the room with that sick person. However, since my English was not very good at that time as I could assimilate only about 50% of the training knowledge from various classes and lectures we had every day I had to study much harder in order to keep up with others. Therefore, I concluded that if I contracted chickenpox I wouldn’t be able to participate in the training for about two weeks. Because of that I decided to ask the Lord to protect me against virus or give me His wisdom how to do it. And when I was praying a strong persistent thought came into my mind prompting me to do the alternating (or contrast) hot and cold showers twice a day. So, being convinced the idea was inspired by the Lord I was taking a very hot shower for about 3 minutes and then I took as cold shower as possible (gradually lowering temperature) for about 2 minutes, alternating from hot to very cold three to five times. I repeated the same procedure twice a day. Unfortunately after a few days the first symptoms of chickenpox appeared anyway, so I got a bit discouraged, but thank God I didn’t gave up on showers. I continued taking them every morning and evening and every time did that treatment the symptoms disappeared. Altogether they appeared 3 times, but every time I did the hydrotherapy they disappeared, and after the third time they never appeared again. However, a very short time after that experience, I was reading a book on health written by certain American physician. And when I read one passage I got very excited. 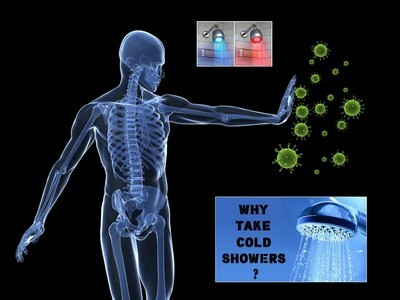 He wrote that even after contracting the chickenpox virus the disease can still be prevented or stopped by an alternate hot and cold showers as it is the best way to weaken virus and stimulate the immune system! That was exactly what I was doing, without even knowing that it was the most effective natural treatment I could use against that disease. So I was very thankful to God and Holy Spirit for giving me His wisdom and inspiring me to perform that approved by Him treatment. Since I didn’t develop chickenpox all students and everybody in that retreat was surprised I was free from any sign of that extremely contagious disease in spite of the fact that I wasn’t vaccinated and never had chickenpox in my childhood. So, I told them the whole story and we all praised the Lord for His love, wisdom and very effective remedies. Well, was God on my side? Yes. Could He heal me without hot and cold showers? Yes, but He wanted me do what I could. He inspired me to use His remedies, be on a very healthy diet, ask for His blessing and trust Him. As a result I recovered without any side effects and with much stronger immune system. 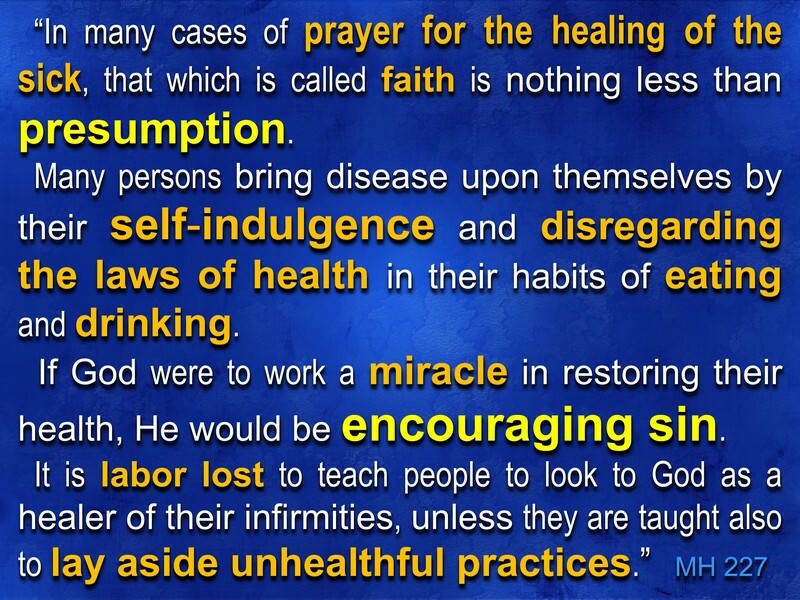 The fact, however, that God wants us now to use healthy lifestyle and natural remedies to treat diseases doesn’t mean that He never performs direct miraculous healing, when it is required and according to His will. Let me give you an example. 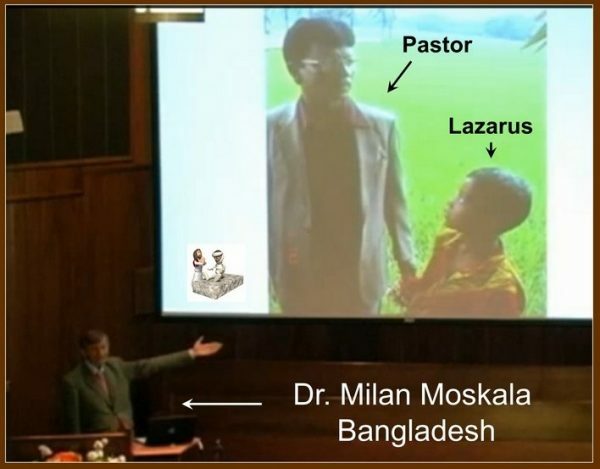 It is a true story I’ve heard from Dr. Milan Moskala, a SDA physician and very dedicated missionary who works as a dentist in Bangladesh. At the same time he spends a lot of time helping poor families there, feeding hungry children with bananas and establishing SDA Christian schools. He told us an amazing story about certain poor woman in a village who accepted Jesus as her Savior and was baptized into the SDA Church. Unfortunately not long after that, her son who at that time was about 5 years old, was playing with another boy, and when he jumped into the water he hit something and died. After about four hours the mother of that boy together with other people from her village finally found her son dead lying on the bottom of the pond. When villagers saw the boy dead they told that woman that their gods punished her for becoming a Christian. Soon after that the SDA pastor came to comfort the poor woman and he was inspired to pray in the presence of all the villagers who were gathered around the dead boy’s body and his crying mother. Initially he didn’t want to pray for a miracle and resurrection of the boy, but while he was doing it the Spirit of God inspired him with faith and courage. And when he prayed in the name of Jesus, suddenly, to the amazement of all the witnesses, the boy moved and came back to life. The first word he said was, „ma, mama”. Since that time almost the whole village accepted Jesus as their God and Savior and they also changed the name of that resurrected boy. Now they call him Lazarus.